Dr. Young co-founded Orthosports in 1989 with his business partner. He graduated from the University of Buffalo in 1984 with a B.S. in Exercise Science, and 1986 in Physical Therapy. Peter returned to school at Daemen College, where he completed his DPT in 2005. 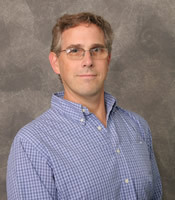 Dr. Young earned certification from McKenzie Institute, USA, and has been a member of the organization since 2001. He specializes in spinal rehabilitation, orthopedics, manual techniques, TMJ therapy, sports rehab, wellness, and aquatic therapy. He has completed numerous continuing education courses since entering private practice. Peter is a clinical instructor. Peter enjoys spending time with his wife, Karen, his family, and his dog. He is also active in his church.